This is a story about Jamie Diggs. Jamie is your ordinary boy. His family has just moved from Kansas to Indiana. One day his father pulls out a trunk that belonged to Jamie’s Great Grandfather. The great grandfather was the original Wizard of Oz. The trunk contains various items for performing magic. Jamie and his father James join a local magicians club to learn about the items in the trunk, and to explore their magical abilities. Jamie’s ability to learn magic soon leads him to the Land of Oz. There he meets many of the characters we grew up with, Glinda, Dorothy, Ozma, and the Tin Woodman. His magical abilities play an integral part in his adventures in Oz. While reading this, I happened to see a lot of the comments on Amazon. Some were less than flattering. I think that was a bit unfair. I thought this book was fun. Was it a great, epic fantasy. No. But I don’t think it was meant to be. Oz was never meant for adults, but for children, and the child in all of us. I think you must let go and grab hold of your childhood at times. If you read this looking for The Hobbit or Harry Potter, I’m sure you’ll be disappointed. However, for 6-9 year olds, who were the original Baum audience, I think they’ll enjoy it. The author managed to capture a lot of th wonder, and feel of the land. Now given, I haven’t read all 40 of the original Oz books, so there may have been times where the author took liberties. However, from what I’ve read, there were times that Mr. Baum himself wasn’t always consistent in what was/wasn’t going on in the land of Oz. It is a fantasy world, remember, not a world based on the rules/laws of physics that we go by. Given a rating, I’d say this is pretty suitable for all ages. Old readers/teens might not get into it, but younger children should. Some scenes may seem intense (Like the flying monkeys were), so you might want to be aware of that. If you have young children, or would just like to travel back to Oz once again, I’d say pick up a copy of Mr. Wallace’s book. This is the first in a proposed trilogy, and I for one would like to see what happens next. Be sure and see our interview of Mr. Wallace here. *Disclaimer* A special thanks goes out to Brandi at BK Walker Books and James C. Wallace II for an e-book copy of this for review. It in no way influenced my review. I would offer my sincere gratitude for this opportunity to speak of Oz and all it contains. Here in the Great Outside, we often forget that Oz exists. Only when circumstances permit do we unveil the mist, cross the Great Sandy Waste and discover that which the mind contains. I am questioned and respond as best time and sanity permits. Rhodes Review: Who are some of the writers you enjoy? Books? Mark Twain; For obvious reasons as he is connected to the heavens. He was born and died on the appearance of Halley’s Comet. Edgar Allen Poe; Again for obvious reasons as he is connected to the soul. I cite Evening Star (1827) as evidence. Gene Wolfe; Once more, obvious reasons prevail as he is connected to the Id. ‘Nuf said. Regarding books, Archie and Mehitabel by Don Marquis, The Claw of the Conciliator by Gene Wolfe, Tamerlane and Other Poems by Edgar Allen Poe and Letters from the Earth by Mark Twain. Oh yea.. I forgot… Heart of the Comet by Benford & Brin. James C. Wallace II: I draw upon my own life and the Hoosier surroundings in which I find myself. There’s a lot of inspiration within the countryside. Also, I must write of Love, truth, friendship, family and loyalty. To do otherwise would make for bad Mojo. Rhodes Review: How do you get your inspiration/muse to write? James C. Wallace II: My muse is a petite person of 0.33 meters tall, carrying an 8 foot four by four and running at top speed towards me. When he, or she strikes, I cannot stop and I write in a very focused, frantic manner. Out of that madness, saneness arrives and winds up on the page. Go figure? Rhodes Review: Looking at your website, it seems like you have a great love for Oz. How did you get this interest? James C. Wallace II: I grew up in a loving household where my parents read to me on a daily basis and taught me the joy of reading. Many a night I recall sitting in our front room as my mother would read from the many books of Oz and my father would act out some of the odd scenes pictured within. As I grew up, my love for reading never diminished and my parents support for my love of reading never wavered. To date, I have yet to tire of reading… and now writing! Rhodes Review: Was there anything special you had to do in order to write about the land of Oz? James C. Wallace II: Just make sure my wife’s cooking was included in the storyline. Trust me when I say it is legendary. That woman can cook up roadkill and make you ask for seconds. I have chosen to make food a primary ingredient in my stories. In Magician of Oz, its Potato Soup. In Shadow Demon of Oz, its the Reuben Samich. In Family of Oz (due out in 2001), its Blackberry Cobbler. By the time you’ve read the trilogy, you’ve had soup, samich and dessert! Rhodes Review: What is the hardest part of writing for you? James C. Wallace II: The hardest part is awaiting the muse. Once she, or he…I’m not quite sure, strikes, the story flows easily and freely. Finding the story is a challenge but not the most difficult part. Stories can be found everywhere if one knows where to look. But getting the muse to inspire and begin the process is the most challenging and difficult step to attain. You know its coming… just hurry up!!! Rhodes Review: What’s the best thing about being an author? James C. Wallace II: Having the ability to place my inner mind onto the outer world and fill the pages with imagery and feeling. Its very rewarding when a child joyfully explains my story to me. Their’s is a unique and wonderfully honest perspective. Rhodes Review: What advice would you give aspiring authors? James C. Wallace II: I can only speak from my perspective but… I believe the most common mistake authors make are allowing others to dictate what you write, how you write it and how you promote it to others. So often, we permit someone outside our realm to give superfluous advice that, at the time would seem to make sense, but in reality does nothing but impair our productivity. As an example, I allowed others to convince me that Twitter was the do-all, magic bullet that would propel my work into stardom. In fact, I have found Twitter to be a colossal waste of time, taking away from other, more productive avenues of marketing and promotion. Also, I have been told by others that this is wrong, or that is wrong. Never what is write… Ignore them all! Others will disagree but my perspective is mine alone. Rhodes Review: Any plans to write fantasy set in other lands? James C. Wallace II: At this point in time, Her Majesty, Princess Ozma has yet to release me from her Royal Command to tell the Great Outside of her new Royal Magician and his battles against Evil in the Land of Oz. I must confess though that I couldn’t imagine writing of any other world on Earth, below or above! Rhodes Review: What is your current writing project? James C. Wallace II: I am currently awaiting the muse’s four by four as I prepare to complete Family of Oz, the third volume of the Royal Magician of Oz Trilogy. Afterwards, I foresee a spin-off tale of wooden rolling pins, auctions and Bean Dinners. Rhodes Review: How has the reception been from Oz fans? James C. Wallace II: For most, the reception is overwhelmingly positive and uplifting. For others, who can say? Rhodes Review: What is one thing you’ve always wanted to be asked, but haven’t been? Rhodes Review: Are there any appearances/conventions you’d like to announce to our readers? James C. Wallace II, author of the critically acclaimed Oz novel, Magician of Oz and the newly released sequel, Shadow Demon of Oz has been invited and will be attending Oz-Stravaganza! 2010 as one of the featured authors of Authors Alley from June 4-6, 2010. I will be appearing and speaking about my literary adventures in Oz alongside 3 of the original Munchkins from the 1939 MGM movie; The Wizard of Oz. These include Jerry Maren, the Lollipop Munchkin; Karl Slover, First Trumpeter Munchkin; and Margaret Pellegrini, the Flower Pot Munchkin. In addition, I will be appearing with Bob Baum, the great grandson of Frank Baum, the author of “The Wonderful Wizard of Oz” (1899) and his wife (Bob) Claire Baum, along with Jane Lahr and Maya Gottfried. Jane is the daughter, and Maya the granddaughter, of Bert Lahr the “Cowardly Lion”. I will speak on several occasions and do book signings during the festival and will appear in the Grand Parade on Saturday, June 6th. I will also be attending the 29th annual Wizard of Oz festival in Chesterton, Indiana, September 17, 18, and 19, 2010. Once again, I will be featuring my newest book, Shadow Demon of Oz as well as Magician of Oz and spreading the story of Princess Ozma’s new Royal Magician, Jamie Diggs. Rhodes Review: Thank you again Mr. Wallace for joining us here at Rhodes Review, it’s been a real pleasure. See our review of Magician of Oz by clicking here. Whoa, Whoa, Whoa, When I scoffed at "Guylons" I had no idea some of you were going to own it so fiercely. You go, dude. 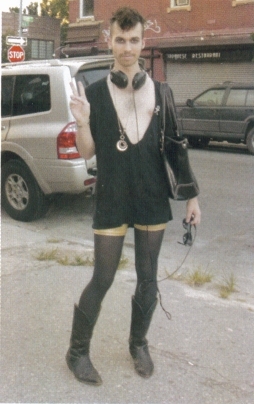 This book is a look at fashion, from mostly ordinary people. As seen from a lot of these pictures, sometimes it goes right. Sometimes, it goes wrong, and other times, it can go horribly wrong. The author pulls no punches, and says exactly what he thinks. For that reason, many of these images wouldn’t be appropriate for young audiences. Some of the comments I’m not sure were appropriate for me. The book has strong language and some occassional naked body parts. If you are a reader who gets easily offended, you might want to steer clear of this book. However, if you don’t mind adult humor, and want a look at things in a vein similar to the People of Wal-Mart, then this book might be for you. If you're going to wear a T-Shirt as pants, you need to own it. *Disclaimer* A special thanks goes out to Anna at Hachette Book Groups for a review copy. We’ve been given the opportunity to interview David Fingerman. 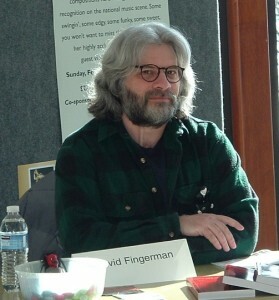 David is the author of numerous short stories. He’s currently doing a blog tour to promote his new book, Edging Past Reality. This is a book of a collection of his short stories. You can see our review, here. David has worked almost 20 years in the Hennepin County Court System. We’d like to thank David for taking the time to answer some of our questions. David Fingerman: Harlan Ellison is my favorite writer, and I’ll read whatever he puts out. A friend of mine recently turned me on to Christopher Moore and I’ve been thoroughly enjoying his books. I also love reading Walter Mosley, Neil Gaiman, John Meaney, Stuart Kaminsky, just to name a few. As far as individual books – “City of Thieves” by David Benioff and “31 Hours” by Masha Hamilton are two of my recent favorites. David Fingerman: Usually it’s just a voice in my head telling me to get to work. I’m very fortunate in that I’m now doing what I’ve always wanted to do – write full time. That’s pretty much all the inspiration I need. All-in-all, I can’t imagine not writing. David Fingerman: I’ve been blessed, or maybe cursed, with a very overactive imagination. I can overhear a snippet of conversation, or look at anything mundane, like a car rolling through a stop sign, and think ‘What if . . .?’ My imagination will take it from there. Rhodes Review: How did you get interested in writing for this genre? David Fingerman: I’ve always had a love for horror and an avid (or morbid) curiosity for the unknown. Plus, I’m kinda lazy and hate doing research. Horror and speculative fiction come straight from the imagination. There’s not a whole lot of verification that needs to be done. That being said, I just finished writing a mystery which needed a lot of research. I guess I’m expanding my horizons. David Fingerman: The discipline. Even though I’m doing what I love to do, there are still days I’m just not in the mood to write and I have to force myself to do so. I compare it to exercising – if you let it slide it’s very hard to get back into it again. On the not so much about writing, but publishing aspect – marketing is very difficult for me. I really dislike having to sell myself, but it’s a necessity if you want to get your work out there. David Fingerman: I love the solitude. I’ve heard that some writers get lonely – not me. I’m not really a ‘people’ person and not having to answer phones or deal with people face-to-face on a daily basis is wonderful. I also love that the only person I have to answer to is me. David Fingerman: More important than anything is to write every day. Then join a writers group. If there’s not one in your area – start one. The man who started one of the writers’ groups I regularly attend told me that for about three months he sat for two hours alone or with maybe one to two others before writers started showing up. Now it averages about fifteen people per meeting and often there is not enough time to get everybody in who wants to read. David Fingerman: I’m working on a horror novel and also just started a suspense/thriller novel. You can read a review of Edging Past Reality by clicking here. Have you ever watched The Twilight Zone or Night Gallery. If so, you’d be the type who would probably enjoy David Fingerman’s Edging Past Reality. This books is a collection of short stories. It’s divided into four sections. There is Too Young to know better, Old Enough to know better, Is this a mid life Crisis, and Senior Moments. Each section of stories deals with people in that specific category. Marty’s Toy – A boy’s toy seems to have a mind of it’s own. Grandpa’s Watch – A pocket watch has a curious connection to a young boy and his grandfather. The Scream Box – Ever wanted to go in a room and scream, this presents customers at a bar with that opportunity, but will they get the relief they want. Anybody got a Smoke – A man dies and goes to Heaven where he’s given everything he wants. Edging Past Reality – A Man’s Life seems to be changing beyond his control. Sometimes with good, sometimes bad consequences. The Blue Light – A man checks into a secluded motel late one night. The Perfect Jury – A tale of jury duty, talk about your nightmares. The Last Patch of Wilderness – A cautionary tale about damaging the environment. The Verdict’s In – For this story, think American Idol meets Judge Judy. With each story, there were twists and turns I never expected. Mr. Fingerman sets you up to think the story is going one way, then throws a curve ball at you. While I had my favorites, I have to say I really enjoyed all the stories. Each had a different feel to it, and as a collection, it was very good. If you like Suspense, Horror, or stories with strange twists, then definitely pick up this book. I think you’d enjoy it. Most of the stories were 3-10 pages long, which made it a good book for reading right before bedtime. Some stories has stronger language or situations, so I’d recommend it only for older teens (17+) or adults. You can visit Mr. Fingerman’s site here. *Disclaimer* A special thanks goes out to Brandi at BK Walker Book Services and David for a review copy of this book. Please See our Interview with David here. Be sure and stop by tomorrow and check out our review of Edging Past Reality by David Fingerman. We will also be having an interview with him. You can see the review here and the interview here. Over at Daisy Chain Book Reviews they are giving away a copy of Candace Bushnell’s The Carrie Diaries. Pop over there and enter. *Oops, I neglected to finish the link information for this previously. Here are some of the reviews that will be coming up throughout May. Street Boners – A Comical look at fashion through mostly ordinary people. Clean, Green, and Lean – How you can be more green, not only in your diet, but in daily living. Edging Past Reality – A collection of horror short stories. The Power of Compassion – A collection of 40 stories based on the ideas of compassion. 9th Judgement – The newest James Patterson Women’s Murder Club thriller. Spirit – A tale of an out of body experience gone wrong. What’s Really Hood – An anthology of Urban tales. A Hole in the Gospel – A Hole exists in our understanding of the Gospel, the writer finds out what that is while working on a mission in Uganda. My last Blog tour for Pynk was pretty successful, so I”ve signed up to do another for a few books. You can hope to see those in the next couple of weeks. Some blog tours planned right now are for What’s Really Hood, and Edging Past Reality. Then of course, some giveaways. Scheduled so far is What’s Really Hood, and 9th Judgement. Not to mention our giveaway for Innocent continues until the 19th. Get your entries in if you haven’t entered. May looks to be a fun month, with a variety of books for a variety of readers.